BENTLEY, Helen Delich, a Representative from Maryland; born in Ruth, White Pine County, Nev., November 28, 1923; attended the University of Nevada, and Georgetown University, Washington, D.C..; BA., University of Missouri, 1944; journalist; television producer; chair, Federal Maritime Commission, 1969-1975; international business consultant; unsuccessful candidate for election to the Ninety-seventh in 1980 and Ninety-eighth Congresses in 1982; elected as a Republican to the Ninety-ninth and to the four succeeding Congresses (January 3, 1985-January 3, 1995); was not a candidate for reelection to the One Hundred Fourth Congress in 1994, but was an unsuccessful candidate for nomination for Governor of Maryland; private advocate; unsuccessful candidate for election to the One Hundred Eighth Congress in 2002; died on August 6, 2016, in Timonium, Md. 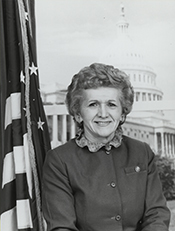 Helen Delich Bentley in Women in Congress, 1917-2006. Prepared under the direction of the Committee on House Administration by the Office of History & Preservation, U. S. House of Representatives. Washington: Government Printing Office, 2006.